Glucosamine is an amino sugar used to create glycosaminoglycans and synovial fluid that keeps the joints cushioned and well lubricated. Glucosamine is important for the structure and function of cartilage in the joints of the body. It helps to stimulate the cells that produce these glycosaminoglycans and normalise cartilage metabolism by inhibiting their breakdown and exerting anti-inflammatory effects. 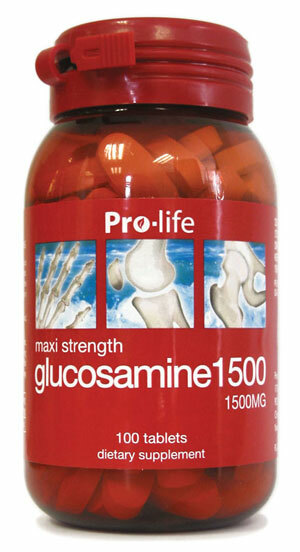 Pro-Life's Glucosamine 1500mg is a Maxi Strength formula to help you care for your bodies cartilage and joints. Glucosamine Sulphate 1500mg, Boron (chelate) 1mg. This product contains tabletting aids and coating colour. Seek professional health advice if pregnant, lactating, suffering from a medical condition, taking medication, experiencing seafood allergies, or a child before supplementing. In rare cases, glucosamine may cause gastrointestinal discomfort. A study was undertaken to investigate the efficacy and tolerance of glucosamine sulphate in patients with osteoarthritis. Thirty patients were divided into two groups where one group received glucosamine and the other one received placebo for three weeks. Efficacy was tested by semi-quantitative scoring of pain at rest and during active and passive movements, as well as the limitation of articular function, before and after 7 and 21 days of treatment. Patients were positively questioned daily for possible intolerance symptoms. During both initial parenteral treatments, each symptom significantly improved, but to a faster and greater extent in the group treated with glucosamine. A further improvement was recorded in the patients treated with glucosamine during the maintenance period, whereas in the placebo group, the symptom scores increased almost to the pre-treatment level. Clinical and biological tolerances were excellent with both treatments. It is suggested that parenteral and oral treatment with glucosamine sulphate should be considered as basic therapy for the management of primary or secondary degenerative osteoarthritis disorders. In London, a mini review of double-blind, randomized, controlled trials was undertaken to determine the effectiveness of oral glucosamine with ibuprofen (NSAID) for the relief of joint pain. The results showed that glucosamine to be of similar efficacy to ibuprofen. It was concluded that glucosamine is effective in relieving joint pain associated with osteoarthritis and this pain-relieving effects may be due to its cartilage-rebuilding properties, which are not seen with simple analgesics, such as ibuprofen. Hence, glucosamine can be used as an alternative to anti-inflammatory drugs and analgesics, or as a useful adjunct to standard analgesic therapy for those suffering from joint pain associated with osteoarthritis. A German article describes the value of glucosamine for the metabolism of articular cartilage. Glycosaminoglycans are essential constituents of cartilage and synovial fluid (hyaluronic acid). They are formed within chondrocyte preferably from glucosamine and bound to protein constituting proteoglycanes. Cultured studies show a dose-dependent increased synthesis of glycosaminoglycans and an enhanced growth of the bones after addition of glucosamine to the culture medium. This finding underlines the importance of a sufficient supply of glucosamine for the joints. McCarty MF explained that rapid clinical response to glucosamine in osteoarthritis is due to the enhanced synovial production of hyaluronic acid by glucosamine. Hyaluronic acid is primarily responsible for the lubricating and shock-absorbing properties of synovial fluid. Many clinical studies suggested that hyaluronic acid has anti-inflammatory and analgesic properties and promotes anabolic behaviour in chondrocytes. The concentration and molecular weight of synovial fluid hyaluronic acid are decreased in osteoarthritis. Therefore, by reversing this abnormality, glucosamine may provide rapid symptomatic benefit and aid the repair of damaged cartilage in the longer term. The oral bioavailability and plasma pharmacokinetics of glucosamine were studied in an open, randomised, cross-over trial. A group of twenty healthy volunteers were given three consecutive once-daily oral administrations of glucosamine sulphate. Plasma levels of glucosamine were determined and pharmacokinetic parameters were calculated. Glucosamine was rapidly absorbed after oral administration and its pharmacokinetics were linear to the dose. Plasma levels increased over 30-folds from basline and the steady state peak concentrations were found at the dose of 1,500mg. This study demonstrates that glucosamine is bioavailable after oral administration, persists in circulation and its pharmacokinetics support once-daily dosage. Glucosamine 1500 also contains boron, a trace mineral present in diet and in the human body. It appears to affect the metabolism of calcium, magnesium, copper, phosphorus and vitamin D. Preliminary research suggests that boron might have an influence on bone and joint health. Since 1963, evidence has accumulated suggesting boron is a safe and effective treatment for some forms of arthritis. Newnham RE from England wrote an article on essentiality of boron for healthy bones and joints. He first experienced alleviated arthritic pain and discomfort from boron supplementation. Later, he found numerous other observations epidemiologic and controlled animal and human experiments. There are analytical evidence of lower boron concentrations in femur heads, bones and synovial fluid from people with arthritis than from those without arthritis. Observation evidence shows that bones of patients using boron supplements are much harder to cut than those not using supplements. There are also epidemiologic evidence that the estimated incidence of arthritis ranges from 20%-70% in areas of the world where boron intakes usually are 1.0mg or less per day, whereas the estimated incidence of arthritis ranges from 0%-10% in areas of the world where boron intakes usually are 3 to 10mg per day. Experimental evidence demonstrates that rats with induced arthritis benefit from orally or intra-peritoneally administered boron. Lastly, a double-blind placebo-boron supplementation trial with 20 subjects with osteoarthritis resulted a significant favourably response to boron supplementation and 50% of subjects receiving the supplement improved. These findings indicate that boron is an essential nutrient for healthy bones and joints. In summary, Glucosamine 1500 containing glucosamine and boron provides important and positive influences on the health of the bone and joint. Glucosamine is an amino sugar used to create glycosaminoglycans and synovial fluid that keep the joints cushioned and well lubricated. It is important for the maintenance of the structure and function of cartilage in the joints of the body. McCarthy M.F., Enhanced synovial production of hyaluronic acid may explain rapid clinical response to high-dose glucosamine in osteoarthritis, Med Hypotheses. 1998 Jun; 50 (6): 507-10. Newnham R.E., Essentiality of boron for healthy bones and joints, Environ Health Perspect. 1994 Nov; 102 Suppl 7: 83-5. Persiani S., Roda E., Rovati L.C., Locatelli M., Giacovelli G., Roda A., Glucosamine oral bioavailability and plasma pharmacokinetics after increasing doses of crystalline glucosamine sulphate in man, Osteoarthritis Cartilage. 2005 Dec; 13 (12): 1041-9. Epub 2005 Sep 13. Ruane R., Griffiths P., Glucosamine therapy compared to ibuprofen for joint pain, Br J Community Nurs. 2002 mar; 7 (3): 148-52. Vidal Y., Plana R.R., Karzel K., Glucosamine: its value for the metabolism of articular cartilage. 1. Biochemistry of proteoglycans, studies on in-vitro cultures of embryonal mouse fibroblasts and bone germs, Fortschr Med. 1980 Apr 17; 98 (15): 557-62.